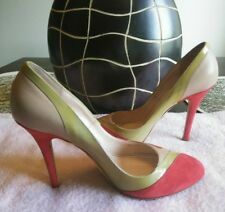 You're viewing an absolutely gorgeous upscale pair of Emilio Pucci Firenze pumps in good pre-owned condition. These pumps do have some wear but plenty of wear left. Measurements; Inner footbed length 10", Widest part of the shoe is 3" Heel 4 1/2" If you have any questions please feel free to message me. Classy Art Deco styling! There are scuff marks and other wear to these shoes from age and usage. Leather sole. 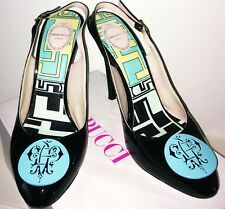 w/ beautiful logo button on closed, pointed toe. Lovely Emilio Pucci espadrilles. Emilio Pucci signature. Fabric is in variations of blue, yellow and white. Leather ankle strap in light brown. Italian size 39. You are bidding on a unique pair of Emilio Pucci Mules Heels Slides Women's Sz 8.5 Gold Weave Italy. Lightweight metal with leather backing. Wood heel that measure just over 3 inches. In beautiful condition. Open toe with jewel detail. US Conversion Size: 8.5. IT Size: 38.5. 100% authentic Emilio Pucci strappy sandals in brown and gold-tone leather. Opens with a zipper on the back. Have been worn and are in excellent condition. We also provide an international size converter on our website as a guideline. Adorable Emilio Pucci Firenze Wedges Sz 8.5 Excellent Condition Aqua, Tan leather strappy accents. Condition is Pre-owned. These have no footprints on the insoles. Shipped with USPS Priority Mail. Original owner, worn twice, I'm a 8 1/2- 9, they fit perfect. Barely worn and in EXCELLENT condition! Hard to find! Heel Height: approx. Shoes have a grosgrain bow atop. You are viewing a beautiful pair of Emilio Pucci Heels done in Brown Leather. These shoes are in NEW Condition. No hidden issues. With original box. Emilio Pucci Beige Canvas, Multicolor Bow Front, Pump. These Gorgeous, Fabulous Pump Feature Canvas Upper, Peep Toe, Beige And Multicolor Silk Trim With Bow Accent At Front, Tonal Stitching And Covered 3 1/2" High Heel.